Greyhound rehoming services, Lincolnshire Greyhound Trust | Lincolnshire Greyhound Trust provides greyhound rehoming services throughout Lincoln, Lincolnshire. To book our services, give us a call today. NOW WITH KENNELS IN OXFORDSHIRE AND EPPING. Our involvement at Lincoln began when we brought home Lone Dynamite (Sky). We had owned her when she raced and we always said that we’d bring her home when she had to retire. That time came in November 1996. We had some sleepless nights and we debated whether we should take her back, but things soon got better. In September 1998 we were asked by a lady who knew us, if we could find her a greyhound. So we went to our trainer and found a suitable dog. We had various dealings with the national RGT, until in December 1998 they asked us if we could set up a branch in Lincoln. In December 2000 we set up a committee which has worked really hard ever since. This committee has been responsible for continual improvements in our rehoming efforts. In 2004 and 2005 we found 90 homes each. In 2006, we rehomed 115 and every year since then, we have rehomed over 100 greyhounds. On 10 May 2004 we became an independent registered charity in our own right. We’re numbered 1103656 and this does give us greater control of our future destiny. We are an entirely voluntary group with no paid employees, so are able to spend all our finances on helping greyhounds. 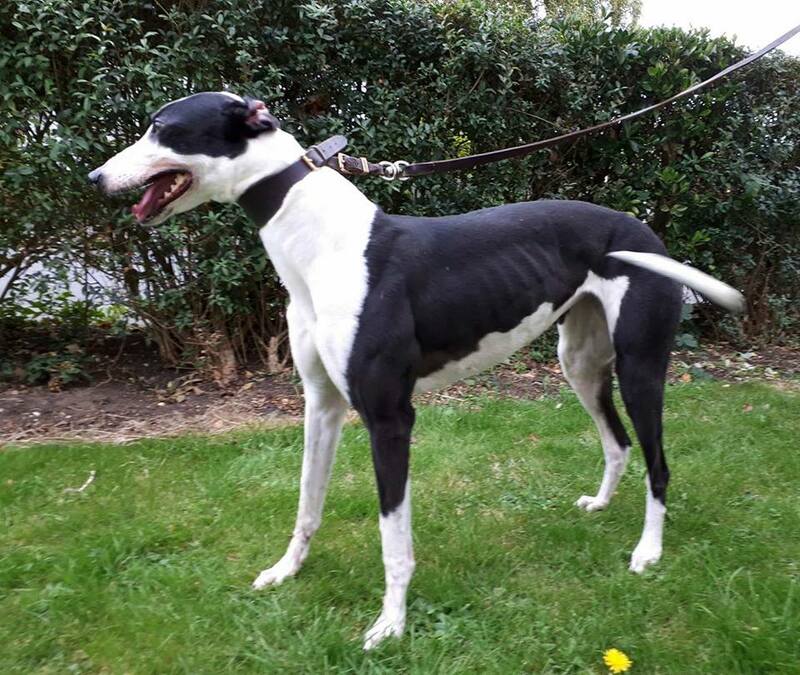 Lincolnshire Greyhound Trust does not usually ‘rescue’ greyhounds as we deal with many of the very responsible racing owners and trainers who care for their dogs and trust us to find them a loving new pet home. We do however help various rescue organisations and provide backup for greyhounds they rehome as well as our own. From December 1998 to 20th April 2019 we have found homes for 1,796 different greyhounds. A date is arranged to visit the kennels or for us to bring a new dog into the home. We are always available to help and assist once someone has taken on a greyhound. We organise a number of events during each year for people to get together with other greyhound owners. Most of our greyhounds are between 3 and 5 years old so they’ll require a 10 year commitment. There may be issues and hassles along the way so you need to be sure that you’re ready for this. We strongly recommend that greyhounds are kept on a lead. Greyhounds are sighthounds who may be good off lead some of the time, but if they see a cat, rabbit or small dog then they may chase them and recall goes out of the equation. This has led to some fatalities. Extendable leads are not recommended, but if used need to be used carefully as a greyhound can accelerate to 40 mph within 3 seconds. If you do use one, please ensure your greyhound is used to it before allowing it a full extension. 1. 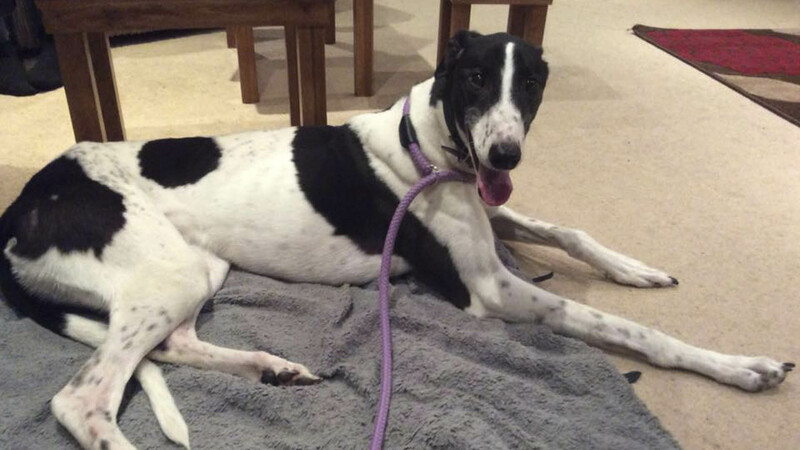 A collar and lead – greyhounds need wide collars which aren’t commonly available in pet shops. 2. A coat – this is waterproof, but also fur lined so it protects the greyhound from both cold and damp. 3. A muzzle – although greyhounds are one of the gentlest breeds of dogs, they may be interested in cats and small dogs. So we provide the muzzle for them to wear to prevent any unfortunate mishaps. All greyhounds, regardless of age, will be insured free of charge for their first 4 weeks in a new home. Our greyhounds are microchipped and registered with the national database in the name and address of Lincolnshire Greyhound Trust. When you take on a greyhound from us we are usually able to transfer the ownership details to yourself, but the emergency contact number ALWAYS stays as the LGT number to give the dog ‘dual protection’ in the event of them being lost or stolen. We provide all the above as standard, but like all the major responsible rehoming organisations we do ask for a commitment from new owners. We now ask for a minimum donation of just £100 from adopters to help cover the costs of the above mentioned items. Taking the neutering into account, we actually lose out on every greyhound we rehome, but we feel that it shows a serious commitment on the adopter’s part to the dog. We are a registered charity (1103656) and so any funds that we receive are used to help us to assist and rehome greyhounds. Sky, a white brindle female was born in Ireland on 1 Sept 1992 and came to England in early 1994. NB: The photos opposite are Sky along with Mandy and one of our other greyhounds Mac!! She began racing at Sheffield in June 1994 and ended up racing 106 times. She won 11 races. With a racing name of Lone Dynamite and being one of the slowest starters at the track, the form guide regularly said she ‘needs a stick of dynamite at the start to get her going’. She ran her last race on 17 November 1996 and we brought her home on 26 November. After early mishaps like eating soap, fish food and anything else that was left around, she soon became accustomed to family life. It turned out she was the most non-aggressive greyhound amongst a breed known for their laid-back nature. 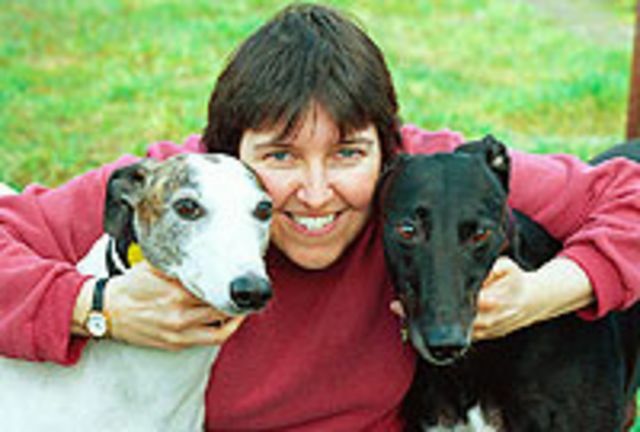 She was cat friendly and her loving nature meant, we were often asked about greyhounds. As a result, we got more and more involved with the RGT. When a lady two doors down from Mandy’s family home asked us to find a ‘dog like Sky’ we took her to the kennels and she went home with Jemma. That was in September 1998 and Jemma stayed in the same home until her death in September 2008. Eventually in December 1998 we became a branch of the RGT. Sky came along on all our home visits and when we attended meet-and-greets at supermarkets, summer fairs and shows, Sky was always there promoting her breed. In 2000 and 2001 she went along to Crufts and slept all day on the national RGT stand while being fussed by hundreds, if not thousands of children and adults. Sky was well known in the Lincolnshire area and it was her wonderful nature and gentleness that persuaded us to try and help more dogs like Sky. 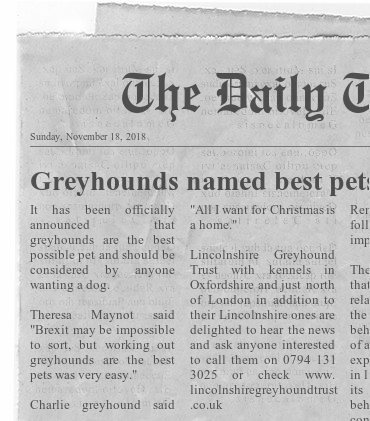 When you tally up the greyhounds rehomed by Lincolnshire Greyhound Trust and its predecessor Lincoln RGT and combine with her efforts on a national basis, she has been the saviour of many greyhounds and an absolutely superb ambassador for her breed. Sky became ill early in March 2002 and was diagnosed with kidney failure. At 6.10 p.m. on 11th of March 2002 she was put to sleep. We miss her everyday. Saturday 13 and Sunday 14 July: The Bucks Country show, Rye Park HP11 1QX. All proceeds from dog show on 14th go to LGT. Whether you take a greyhound from us or not, please consider putting up our poster in your locality. Imagine the thrill if someone rehomes a greyhound from us after seeing your poster. You can find a copy of our poster here. Lincolnshire Greyhound Trust provides greyhound rehoming in Lincolnshire and surrounding areas. We also now have kennels in Oxfordshire and Epping.